Pack a hot lunch with ease and style with this great insulated set. 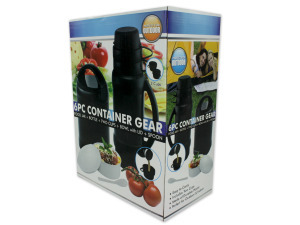 It features a food jar and bottle with 2 cups, a bowl with a lid and a spoon. Everything fits together for a tidy and compact look. Features a handle for easy carrying; plastic makes it durable and perfect for indoor and outdoor use.